At a time when moving images dominate our lives, the idea of "visual literacy," the ability to read and understand images, has taken on a greater urgency. That's one of the impulses behind “Portraits of America: Democracy on Film,” a new program from The Film Foundation, in partnership with the American Federation of State, County and Municipal Employees (AFSCME). Offered free of charge to elementary and high schools, “Democracy on Film” is made up of eight modules addressing different aspects of the democratic experience, including immigration, labor, civil rights and the press. Within each module, scholars, educators and filmmakers examine movies that reflect American democratic ideals. The titles extend from 1917 to 2006, and include comedies, documentaries, drama, science fiction, horror, cartoons, historical fiction, independent films and Hollywood blockbusters. Accompanying the curriculum are a teacher's guide, a reader for students, PowerPoint presentations, and a DVD (which can also be streamed) that includes film excerpts and additional material. 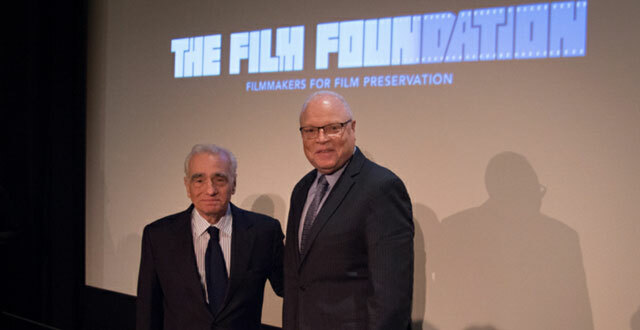 Speaking on a panel at New York City's DGA Theater, award-winning director and Film Foundation founder Martin Scorsese noted, "We already teach our students to be critical thinkers, now we have to start teaching them to be critical viewers as well." For Scorsese, it's crucial that young people "learn to sort the differences between art and pure commerce, between cinema and 'content,' between a sequence of individually crafted images and a sequence of factory-manufactured, mass-produced images engineered only to grab your attention and sell you something." Other panelists included Librarian of Congress Dr. Carla Hayden; author, professor and film historian Jeanine Basinger; curriculum author Catherine Gourley; and Lee Saunders, president of AFSCME. "This is an opportunity for my union to put forth the importance of labor history, in the context of American democracy," Saunders said. "Whether it's women's marches or civil-rights marches, things of that nature, struggle has always been a part of our history. We've got to understand that struggle, make that connection with young people so they understand their history. Improving our democracy is a duty we all share." According to Basinger, "We are living in a world of moving images. Outside the classroom, the moving image is the major form of communication for these young people, a major source of their learning about what's going on in the world, a major source of the way the world speaks to them. It's also the way they communicate with each other. "The young people of America are simply not educated if they cannot understand how to see moving images, how to interpret them, how to unlock their subtexts and messages, how to read them for an understanding of the country they live, warts and all." Gourley, the author of more than 30 books, began working on the“Story of Movies” program in 2005. For her, one of the primary goals of “Democracy on Film” is to teach students "how to read a film on multiple levels. Most obviously, what is the story about, what is its narrative structure, what does it mean? But also how to read a film as a work of art. Equally important is learning to read a film as a historical and cultural document." Dr. Hayden noted that the curriculum will be added to the “Teaching with Primary Sources” curriculum, which focuses on showing teachers and students how to work with original documents. Through the extensive holdings of the Library of Congress, Hayden and her staff were able to supplement film titles with contemporary reviews, political cartoons and interviews that help explain their times. These materials will be especially useful with some of the titles in the program, like Salt of the Earth, a 1954 independent film about a strike in New Mexico. "Whatever you may think of the film, Salt of the Earth is a really interesting example of making a picture outside the system," Scorsese said. "They made that film with no help at all because they needed to. What is it all about? It's about human dignity, freedom. This is what we have to fight for." "One of the things we tried to do with a film like Salt of the Earth is provide primary source materials that explore the tenor of the time," Gourley added. "How people reacted to it at the time. Salt of the Earth was condemned on the floor of Congress, so we include that speech from that congressman, and we allow the students to read it and ask them, what do you think?" "It's humanizing issues to make you think further than just slogans, and make you aware of things in your own life that you maybe haven't thought about," Basinger agreed. "And with a film like The Immigrant [made by Charlie Chaplin in 1917], there's no great political leveler like humor." Salt of the Earthis one of five titles in a module on "The American Laborer." Others include Barbara Kopple's Harlan County U.S.A. (1976), about a coal strike in Kentucky, and Martin Ritt's Oscar-winning union drama Norma Rae (1979). "I learned a lot about unions," Scorsese recalled. "My parents worked in the garment district, my mother was a seamstress. This was before the unions, the sign was: 'You don't come in Sunday, don't come in Monday.' That's not even about hardship, about treatment. Somebody's got to get organized. Then you go from there. A film I'm making now [The Irishman], one of the characters is Jimmy Hoffa. Whatever may have happened in the Hoffa story, he was still on those picket lines getting his head busted." The next program from the Film Foundation's “Story of Movies” will cover one of the country's enduring themes: “The American West and the Western Film Genre.” It will be released later this year. "Division, conflict and anger seem to be defining this moment in culture," Scorsese summed up. "I learned a lot about citizenship and American ideals from the movies I saw. Movies that look squarely at the struggles, violent disagreements and the tragedies in history, not to mention hypocrisies, false promises. But they also embody the best in America, our great hopes and ideals."